2nd match of Carlton Mid Tri-Series has been played between Australia and India at Melbourne Cricket Ground today. Australia registered back to back 2nd win of Tri series with MA Starc's superb peace of bowling with 6 wickets in his 10 overs of 43 runs. Earlier, India won the toss and decided to bat first. India lost S Dhawan in very first over scoring just 2 runs of Starc. AM Rahane (12) and Virat Kohli (9) also departed early. SK Raina joined with RG Sharma and played good inning fo 51 runs. RG Sharma played superb inning of 138 runs and India managed to put 267 runs at the enf of 50 overs. 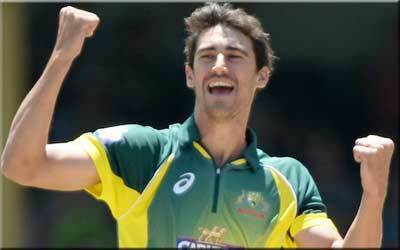 MA Starc (Australia) picked-up 6 wickets. Following target of 258 runs, Australia started inning with DA Warner and AJ Finch. DA Warner started well but got out scoring 24 runs. AJ Finch played good inning of 96 runs before he left the field. SR Watson (41) and SPD Smith (47) also contributed well. rest was done by BJ Haddin and JP Faulkner and Australia won the match in 49 overs by 4 wickets. Australia got 4 points and India yet to win.